How Does Listed Property Affect Home Business Taxes? How Does Listed Property Affect Business Taxes? Listed property is a specific type of personal property in a business. The rules for deducting expenses associated with the purchase and use of listed property for you and your employees for business purposes are different from the rules for other types of property. Trying to keep track of business and personal use of listed property is difficult. Until the IRS figures out some better way to do that, you should continue to keep detailed records of employee use of company-provided autos, and other listed property, if you want to deduct these costs as business expenses. Property generally used for entertainment, recreation, or amusement, including digital cameras and video recording equipment. As of January 1, 2010, cell phones and other similar personal telecommunications devices were no longer considered "listed property." Also as of January 1, 2018, computers and peripheral equipment were removed from the definition of listed property. This change was put in place by the Tax Cuts and Jobs Act of 2017. Just because these items have been taken off the listed property designation, doesn't mean you don't have to keep track of them. You may still be required to show that they are being used by the business. What Evidence is Needed to Deduct Listed Property as a Business Expense? The IRS says that costs associated with​ ​the use of listed property are not deductible as business expenses unless the taxpayer has sufficient evidence to prove the amount of the expense and its use in the business. That is, you must prove the date of the expenditure or use of the listed property item and its business purpose. In addition, you must be able to prove that the person using the property has a business relationship with you as the business owner. That is, the person using the property must be your employee or a contract worker. the amount of each business use "based on the appropriate measure (that is, time) and the amount of total use of the listed property for the taxable period." In other words, how much of the use was for business and how much for personal. Because listed property can be used for personal purposes, if you wish to depreciate this property or deduct expenses for use of the property, you must substantiate the business use of the property. The predominant use test says that the asset must be used predominantly (more than 50%) for business purposes. If more than 50 percent of the total use of the asset is related to your trade or business, the asset is considered a business asset and the business use of that asset can be depreciated. If the asset meets the "predominant use test," expenses related to use of the asset related to business use can be deducted. The IRS assumes that business equipment in a non-home business is being used mostly for business purposes. 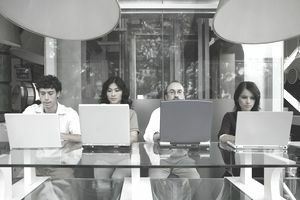 But such equipment in a home-based business — computers and peripherals and cell phones, for example — may be used for personal business. In home business, it is more important to keep good records on all listed property and to make sure you can prove business use for that property. Let's look at two circumstances here: (a) If the business buys listed property used by employees, and (b) if an employee uses his or her own listed property for your business. A. If you pay for the property used by an employee and the use is for a business purpose, the charge is considered by the IRS to be a "fringe benefit." As such, it is not taxable to the employee and it is deductible by you as a business expense. If you pay for the property and the use is for a personal expense, the charge is considered personal. It is not deductible by you as a business expense and it is taxable to the employee. The IRS states specifically: "the fair market value of such usage is includable in the employee's gross income." Deduction for Employees: Employees can deduct listed property on their personal tax returns only if (1) it is for the employer's convenience, or (2) it is required as a condition of employment. If you want to take this deduction, be sure you can substantiate one of these two criteria. Business Use Requirement: The property must be predominately (more than 50%) used for qualified business purposes. Again, you may have to prove this requirement. Use for the employer's convenience. Whether the use of listed property is for the employer's convenience must be determined from all the facts. The use is for the employer's convenience if it is for a substantial business reason of the employer. The use of listed property during the employee's regular working hours to carry on the employer's business is generally for the employer's convenience. Use required as a condition of employment. Whether the use of listed property is a condition of employment depends on all the facts and circumstances. The use of property must be required for the employee to perform duties properly. The employer need not explicitly require the employee to use the property. A mere statement by the employer that the use of the property is a condition of employment is not sufficient. Listed property which does not meet the predominant use test is not eligible for Section 179 depreciation or other accelerated depreciation methods. Expenses for listed property which does not meet the predominant use test are limited. Depreciation on listed property may need to be depreciated using the alternative depreciation method, which increases the ADS generally the number of years over which property is depreciated, thus decreasing the annual deduction.